From the Vendor: A new high quality White Vein Maeng Da Kratom leaf from deep within the Jungles of Indonesia. This newly discovered strain has been getting great reviews from around the web. Harvested from only the most mature leaves, this variety is then finely ground to the consistency of pure quality powder. I have tried other vendors and purkratom by far is the best vendor online. Highest quality kratom powder, fastest shipping out there. Kratom has helped me with pain from past injuries, depression and anxiety. It is natural alternative to big pharma and I am grateful that it is available to me. 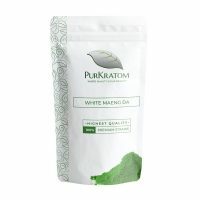 White Maeng Da works the best for me and I only have glowing reviews of Purkratom!